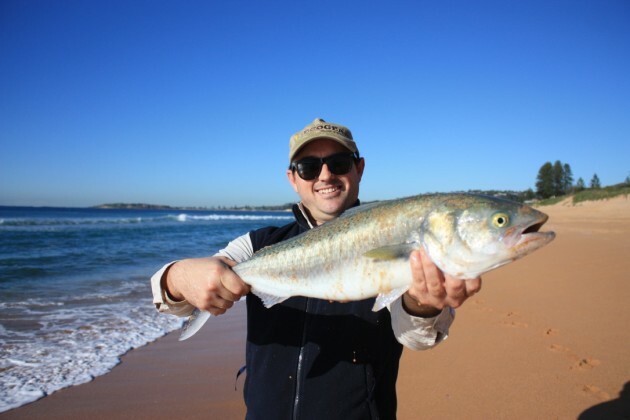 AUSTRALIAN salmon are a popular target species for surf and inshore anglers alike along Australia's southern coastlines. The name "salmon" is a misnomer, as these fish are not "true" salmonids (family Salmonidae), but instead they are members of the family Arripidae, a group of salmon-shaped fish which occur only in Australian and New Zealand waters. There are only four species in the family. The smallest member is the tommy ruff or Australian herring (Arripis georgianus). Tommies look somewhat similar to small Australian salmon but are easily distinguished by their rough scales, black tips on their tail and grey coloured pectoral fins. Small Australian salmon, on the other hand, have smooth scales and bright yellow pectoral fins. They also grow much larger than tommies, which only reach around 40 cm in length, while Australian salmon can grow to over twice that length. There are actually three species of "salmon" in our waters. Adults of the Western Australian salmon (Arripis truttaceus) breed in the southern parts of WA, and their eggs and juveniles get dispersed into South Australia, Victoria and Tasmania by the Leeuwin Current. This species grows to around 80cm fork length, but adult fish are rare in Victoria and the eastern parts of South Australia, as the adult fish tend to migrate west towards the spawning grounds as they grow. Tag returns have shown that once tagged, western salmon behave differently and tend not to migrate as much as uninjured fish. The Eastern Australian salmon, or kahawai (Arripis trutta) is distinguished from the western species by having 33 to 40 gill rakers on the first gill arch, compared to only 25 to 31 for the western salmon. This species occurs in New South Wales, Victoria and Tasmania, also Lord Howe Island and New Zealand, while occasional schools also migrate as far north as South-East Queensland during some winters. Eastern salmon usually don't grow quite as large on average as the western species, topping out at around 75cm fork length in New Zealand. The granddaddy of them all is the northern or large tailed kahawai (Arripis xylabion). This species, which can reach around a meter long and over 10kg in weight, is found only around Lord Howe, Norfolk and the Kermadec Islands, with occasional stragglers reaching northern New Zealand. As its name suggests, this species has a comparatively larger tail, which is longer than the length of the head. All three species of Aussie salmon are highly visual feeders which eat a variety of crustaceans and polychaetes as juveniles, but shift to baitfish (mainly pilchards, sprats and anchovies) as adults. Their voracious feeding, often in large schools, sparked interest from scientists regarding how much they actually eat and whether they exert “top down” pressure on baitfish species lower in the food chain. After studying this subject for several years, scientists from NSW fisheries deduced that over the course of a year, Eastern Australian salmon ate an average daily ration of 0.9–1.4% of their body weight per day, which was lower than for other similar predators like tailor and the American striped bass which eat around 5-6% of their body weight per day on average. Even so, over the course of a year this suggests that Australian salmon eat over four times their own body weight in smaller pelagic prey species (including pilchards, scads and other zooplanktivores which comprised around 93% of stomach contents). Assuming an eastern stock of 10,000 tonnes of salmon, this indicates they eat over 40,000 tonnes and possibly up to 50,000 tonnes of baitfish annually (depending on water temperatures), which was estimated at around 15% of the total spawning biomass of the small pelagic baitfish stock each year. In turn, adult eastern salmon were preyed upon by several apex predators including seals, dolphins and sharks. Feeding salmon schools also migrate long distances and push baitfish up to the surface where they are accessed by seabirds, so all things considered, schools of Aussie salmon play an important ecological role in energy transfer amongst the upper levels of the pelagic foodchain in our inshore ecosystems. One other interesting fact about these fish is that there is evidence their diet has shifted markedly in recent decades. Historic studies from the 1950’s and 60’s found that adult eastern Australian salmon ate mainly krill and squids, species typically associated with cooler waters, but today their diet is dominated by small pelagic baitfish. The reason why is thought to stem from long term changes in the Eastern Australian Current driving warmer waters further and further south over the last few decades. Scientists consider this “multi-decadal southward penetration of the EAC” is one of the clearer signs of the current global warming trend and the shift in diet of Australian salmon is a biological record of this.